Lettera di un dottore dell'ordine di S. Domenico, sopra le cerimonie della China. Cologne [=Amsterdam? ], heirs of Cornelis van Egmond, 1700. 8vo. Contemporary sheepskin parchment. 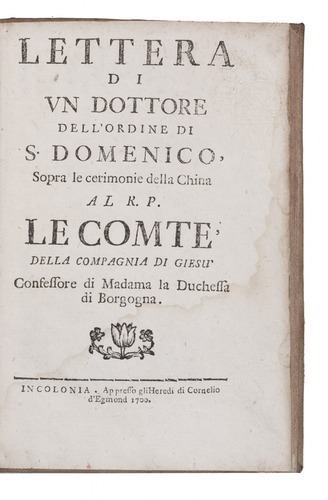 Only edition of a surprisingly rare Italian translation of Noel Alexandre's lettre d'un docteur de l'orde de S. Dominique sur les céremonies de la Chine published in the same year also by Van Egmond at Cologne, a name and address common in false imprints by Dutch publishers between 1666 and 1769. 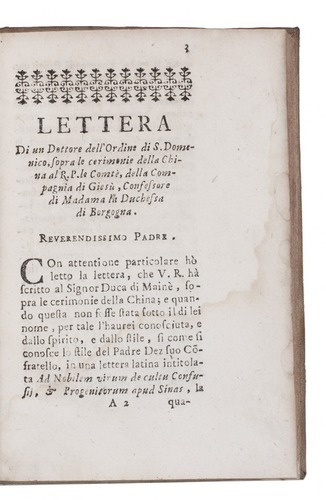 In this anonymously issued series of seven letters, the French Dominican Alexandre responds to the Jesuits who were permitting converts to continue practicing the Confucian rites and who falsely claimed the Dominicans were also permitting this. First ten leaves with minor dampstains. Very good copy. KVK & WorldCat (1 copy); Michel, Repertoire des Ouvrages Imprimés en Langue Italienne au XVIIe siècle I, p. 87; cf. Löwendahl 238; Lach & Van Kley III, p. 386.